Wahab Riaz is also fondly called Vicky by his team mates, and is a left arm medium pace bowler, and a right handed bat, who has played first class cricket for Hyderabad, Lahore and Punjab. Eight years after he made his first class debut, he was picked in the ODI squad for the series against Zimbabwe, and finally made his debut in the 5th ODI. The Zimbabweans found it difficult to pick him, as he scalped a 2/19 in the eight overs that he bowled. He also made his T20 debut in 2008, when he was picked for the ODI and the T20 series against the Bangladesh side. He did not get a chance to bat, but as a bowler picked up 1/7 in 2 overs. With Shoaib Akhtar serving a suspension, there is a good possibility of Wahab Riaz getting picked for the Pakistani team in the future. In the World Cup 2011, he bagged 5 wicket haul in the semi final against arch rivals India, which unluckily came in a losing cause. His performance is not consistent with his performances and the emergence of Junaid Khan and Muhammad Irfan has made his presence down. He has been selected by the selectors for World Cup 2015. Wahab Riaz's left-arm fast medium has benefited from Pakistan's chronic poor luck with fast bowlers. With Shoaib Akhtar and Mohammad Asif missing more than they play and Umar Gul injury-prone. His first real test came against India in Bangladesh, where after 9.2 expensive overs, he was taken out of the attack for bowling two beamers. 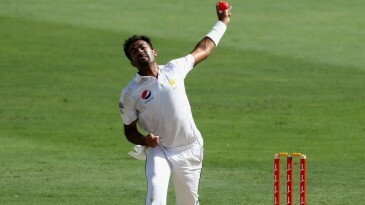 But as Pakistan misses its leaading bowlers Riaz's brisk pace remains in national contention. Find Wahab Riaz profile and stats of batting, bowling and fielding including latest updated news of Wahab Riaz, videos and images at Hamariweb.com. Also find detail Player profile and career statistics of Wahab Riaz of Pakistan. Find Wahab Riaz profile and stats of batting, bowling and fielding including latest updated news of Wahab Riaz, videos and images at Hamariweb.com. Also find detail Player profile and career statistics of Wahab Riaz of Pakistan. Wahab Riaz is growing to be an amazing fast bowler for Pakistan. He is aggressive and plays natural cricket. I wish him best of luck for Asia Cup and World T20 !! I think Wahab Riaz is the only fit bowler in Pakistan T20 world cup squad who can turn the match completely. His performance in the PSL is also good, I hope he can do good in the asia cup. what a fame he is getting just from one awesome spell he is simply out standing. best of luck dude..
next captian and the best bowling all rounder for Pakistan right know. he is awesome job with this batting to. i want him to be a captian of Pakistan and bowl fast as we done vs Australia. he is really bowling fast in this world cup.. he is the one who is fully fit in this Pakistani bowling line up. I still remain 2011 world cup performance of Wahab Riaz against India and i hope he will repeat once again in this time, i am waiting for the match against india. why they take Wahab Riaz for world cup 2015 how much money did you take pcb... its crystal clear that you guys did corruption in selecting players. 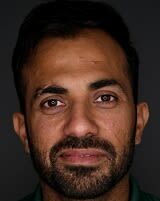 Wahab Riaz - Find Wahab Riaz of Pakistan Cricket Team complete player profile, number of matches, runs score, wickets & catches, Statistics, Records, Wahab Riaz Latest News, Wahab Riaz Videos, Wahab Riaz Photos, and other Wahab Riaz Cricket Team players.